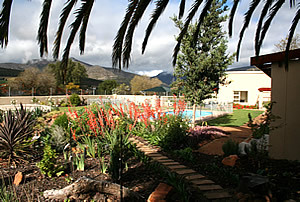 The landmark Kloof Hotel on the outskirts of Joubertina has been converted into 15 residential units. The security complex is gated, and boasts a swimming pool. 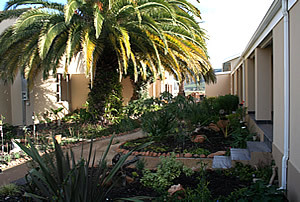 Set in a professionally landscaped garden, spacious green areas exude a cool tranquil atmosphere which offer a welcome haven during lovely hot Langkloof days. The magic sunsets can be enjoyed from the units’ patios that overlook the manicured gardens. Although rebuilt, great care was taken to retain the uniquely spacious character of the original building style while creating accommodation for a modern lifestyle. There is a choice of one, two and two-plus-loft bedroomed units. Several units enjoy exclusive-use private gardens and carports. The remaining units have exclusive carports in the complex. Although there are no lock-up garages, cleverly well-appointed exclusive-use lock-up store-rooms are available to meet additional storage needs. The units are available for immediate occupation. National airports are nearby: George - 180 kms to the west; Port Elizabeth - 180 kms to the east. Joubertina has a nine-hole golf course, with talks of a designer 18-hole course in the offing. Several 9- and 18-hole golf courses are within easy driving distance. The R62 is renowned for its tourist haunts: the Baviaanskloof Wilderness Area, is a popular destination for eco-tourists and adventure-seekers alike, and the revived narrowgauge Apple Express train running past the complex, is offering families, tourists and steam enthusiasts the ride of their life. The long beaches of world-famous surfing mecca, Jeffreys Bay, and St Francis Bay, are less than an hour drive away. 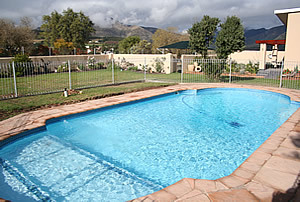 The Sectional Title units are priced from R309,000 to R879,000. VAT at 14% is the only cost to be added to this. There is no transfer duty. The complex is managed by a Home Owners Association under strict House Rules. Levies indicated on the price list (PDF File view) are preliminary estimates and will apply until the next Annual General Meeting when owners will set the budget.. Copyright @ diekloof.co.za 2008. All rights reserved. Designed, Developed & Hosted by PCD Agency.